Condenser choice is critical to the process of air conditioning any vehicle. Condensers throughout their history in mobile applications have changed substantially. Shortly after the automotive market considered air conditioning as a factory option, the need for efficiency in function, size, and cost became extremely critical. R-12 refrigerant was the most widely used refrigerant for the past 70+ years and as for condenser design, copper or aluminum 3/8- 1/2" tubing with aluminum fins became the norm in most applications. R-12 functioned well in this core design. Then with the outlawing of R-12 manufacturing in Europe and most of North America, and the introduction of R-134a as the automotive manufacturers choice in new vehicle production, it became necessary to re-engineer the ac system. The evaporator had already undergone some efficiency changes, the compressors were being designed for the most part with better seals and now new lubricants, but the condenser was another story. The round tube and fin design was just extremely inefficient in removing heat from R-134a refrigerant. Within the years 94-95, all of the heat transfer manufacturers were having to rethink the design of the condenser. Two designs eventually won out. The first requires larger core size. The 6mm 'piccolo' tube design used especially on trucks took the original round tube design, narrowed the tubes and split the flow into several tubes that serpentine down the core. Higher fin counts were added and efficiency went up dramatically. The second design is known by several names. The most common are 'multi-flow', 'parallel flow' and 'super flow'. The design of this style of condenser allows for smaller sizing and even higher efficiency. The parallel flow condenser utilizes a manifold tube on each end of the condenser which allows refrigerant to free flow into the condenser, then cross the condenser through 'micro' channeling. These condensers can be built single, double, triple, or quadruple pass and with the multiple micro passes across the condenser the refrigerant makes more contact with the transfer surfaces. Flightline's condensers are parallel flow, multi-pass condensers that are designed for the specific aircraft that they are being installed in. 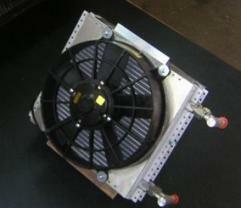 The condenser assemblies include condenser, electric fan, and shroud. The LancAir IV-P had several issues to overcome. One problem was the need to keep the condenser in board. An inboard mounted condenser reserves the flight characteristics of the aircraft as well as doesn't require a very obtrusive belly scoop to hang down under the aircraft. The problems with inboard mounting is getting the condenser cooling air in and out of the aircraft. Flightline is the first manufacturer to utilize a multi-flow condenser assembly that is efficient enough to be mounted inside the aircraft and still condense the refrigerant. The IV-P kit has given Flightline the edge in the aircraft market to now bring the most effiecient system available to the ES, ES-P, Legacy, Vans RV-10, Velocity, ViperJet, Epic, and really anything else that our components will operate in. Horizontal Condenser Mounting - A big No-No! Many have asked why we don't opt for mounting the condenser either in a scoop or pod outside the body of the aircraft or even inboard, lying down horizontal to the aircraft. The reason is that we don't want to nor do we have to compromise our system this way. Condenser technology of old utilized round copper tube construction with 1 or 2 passes and R-12 or R-22 as refrigerant. The size of the r-12 and 22 molecules as well as their ability to collect heat and then release heat allowed the condenser to be laid down flat and still perform its duty. There were no problems with 'oil sumping' (retaining the oil in the condenser) and no problems with poor heat transfer away from the system with proper air flow across the condenser. Then came the ban of the production and use of R-12 and R-22 in all of the modern world, and things changed. Condenser technology had to change with the introduction of R-134a. It did not give up heat as easily as R-12 and it did not return the mineral oil back to the compressor. Much was tried to overcome this. Larger fans, more aerodynamic shrouds, better lubricants. It all helped, but the design of the condenser was the problem. The condenser was changed to 2 functional designs, and one has become the most widely used. The 'multi-flow' or 'parrellel flow' condenser is manufactured with 2 main components. The headers and the core. The inlet header is a larger tube that receives the refrigerant from the compressor and distrubutes it into the core. The core is constructed from extruded 7/8" or so tubing with 7 to 9, 20mm - 40mm micro tubes running through it. (See figure 2b). The vertical tubes fill the horizontal core and pass the refrigerant from one side to the other forcing the refrigerant to give up its heat as it passes through the core. The refrigerant and oil pass through the condenser returning to the cabin to absorb more heat and then to the compressor to lubricate and cool it, and then go around again to continue this process. The 'multi-flow' condenser performs very well in this vertical flow (in the top and out the bottom) format and has gravity helping with this process. Now understanding how the multi-flow condenser works, let's look at what happens when you lay down a multi-flow condenser. Refrigerant and oil enter just as before and is forced into the core just as before. The difference is that oil is heavier and thicker than refrigerant gas. The oil (because of gravity) is allowed to enter the bottom of the now vertical tubes and can be easily separated from the refrigerant. The refrigerant taking the higher tubes travels back through the system without the oil which became trapped in the condenser. The refrigerant continues this process without taking the oil back to the compressor and ultimately starves the compressor for lubrication. Some compressors survive, others do not. High ambient temperatures and the high hours of use seem to increase the rate of failure of these systems. As a developer of highly effiecient and modern ac systems, you can rest assured that Flightline AC, Inc. knows the components that we choose to use. We know how they work and how they get compromised. When you buy a complete system from Flightline AC, you can find comfort in the fact that we have designed and tested our systems completely before we considered selling even one.